Thanks Erin, I’m glad you enjoyed it. I understand your feelings about the way things are going. There is no point in pretending that we don’t have massive problems; on the other hand I think we are still some way off from the end-game that the Old Timer talked about. Don’t forget that conservation organisations around the world are good at releasing press briefings on biodiversity declines. It is after all how they raise funds. Twenty years ago, following the 1992 Rio Summit, one of the two legally binding agreements opened for signature was the Convention on Biological Diversity (CBD). The biodiversity narrative back then concerned genetic resources and chemical diversity in rainforests. We were told that the forests could be ‘mined’ by pharmaceutical companies and turned into economic powerhouses of the future. It didn’t happen. It was the product of over-optimistic, head in the clouds, thinking. Fortunately it didn’t prevent other good work being undertaken on behalf of CBD on species conservation and protected areas. Agenda 21 also arose within the 1992 Rio Summit to promote sustainability in its many aspects. It led us to the main outcome document of Rio+20 “The Future We Want”. How does Rio+20 compare with its older sister? I agree with you that the results are disappointing. Did the conservationists get it wrong this time? Personally, I think the problem is more that we expect too much from global Conventions and don’t do enough to make things work at the local level. Maybe I should explain that. Much of the professional work of conservationists that I come across is taken up with formulating new policies and then presenting them with impact. They devise strategies for countering the effects of climate change, curbing expansion of Asian markets in wildlife products, monitoring the spread of alien species, and assessing the impacts of commercial farming. This is sophisticated and important work. Linking all this together we arrive at today’s narrative on biodiversity which is about ecosystem services. Forests are a source of water for farms and cities. They absorb carbon dioxide. They yield timber and non-timber resources. They attract paying tourists. They provide a habitat for many plants and animals. They have value for these and other services. The amazing grey mangrove (Avicennia marina). Therefore, the argument goes, we need to sustain biodiversity for the sake of the economy and livelihoods into the future. These arguments appear in the Rio+20 working paper “The Future We Want” (see section V. “Framework for action and follow-up”, sub-sections “Oceans and seas” and “Biodiversity”). Whether this narrative proves to be any more successful than the previous one will depend on hard slog at the local level by those who put words into actions. This I think is a bigger challenge than signatures on bits of paper. When I was working recently in an East African country on a UN environmental project, my national counterpart asked a senior representative of the Ministry of Water if they would consider payments to villagers living in mountain forests. The logic was that payment would be in return for cessation of deforestation activities, which would in turn maintain long term water supply to downstream users of water in commercial farms and cities. The representative laughed saying that they were in the business of charging villagers for their use of water not paying them. 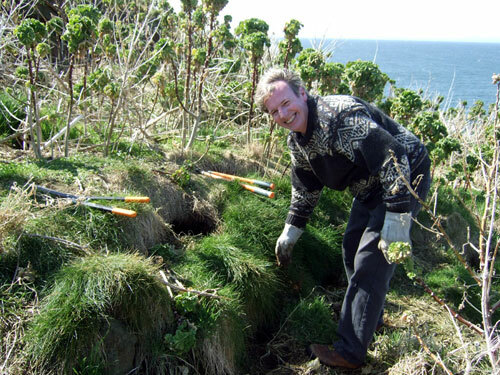 Clearing tree mallow on an island in the Firth of Forth to provide puffins with nesting burrows. If we are to be critical of conservation, and I think it is important that we are critical, that we do expect clarity of thinking and effective accomplishment on the ground, it is in the latter part – the failure to put policy into practice – where we should focus. 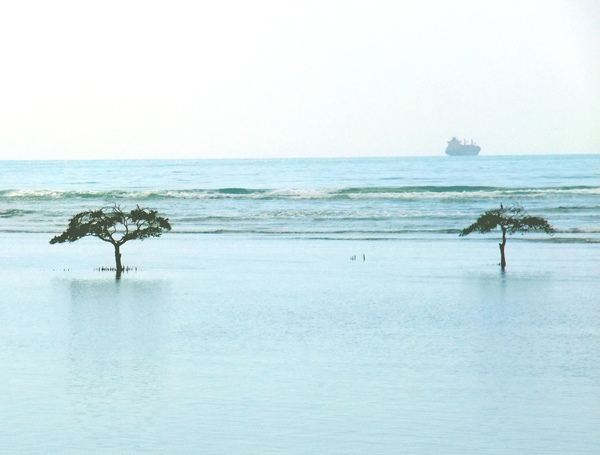 In my opinion, it is easier to devise clever strategies that can be ‘sold’ to politicians at Conventions and to the public in general, than it is to plant mangroves on intertidal mudflats in Southeast Asia, against the backdrop of ill-disposed shellfish collectors, or to persuade through two score meetings with disaffected UK fishermen why they should respect marine reserves for the long-term welfare of fish stocks, or to clear Japanese knotweed from the riverbank. Nature clubs, local branches of government, volunteers and temporary workers undertake much of the physical and dangerous work of conservation gaining small recognition or remuneration in the process. Perhaps conservation organisations and environmental departments could take a leaf from Mao Tse-tung’s Little “Red Book” and require all senior staff to spend stints in the countryside to experience manual conservation work at first hand as a foil to the ‘bourgeois’ tendency to prepare policies for others to implement! The manual work can of course be great fun and I seriously think all would gain from such a practice. Another observation about good things that can happen where you least expect them is that poorer nations are often more open to new conservation initiatives than wealthy ones where powerful vested interests feel threatened by new ideas. Far from being the problem they are made out to be, poor nations may be able to teach us something about how to live with nature if we care to listen. I don’t know if any of the above adequately addresses your concerns, which I share. But let’s in any case not forget to enjoy nature whenever we can. We are as much a part of the wild Earth as the tiger stalking deer in the forests of the Russian Far East or the pink-footed geese arriving from Iceland over the estuaries and salt marshes here in East Lothian. We can and should let loose the wild side from time to time and thrill at the beauty and wonder of it all. 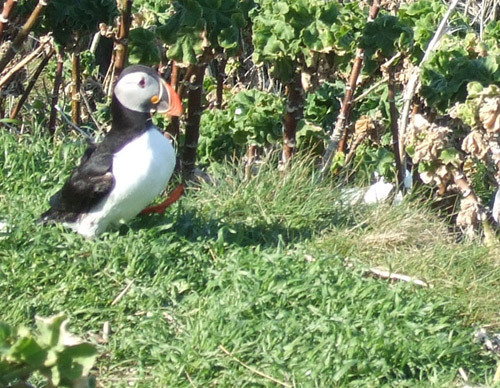 This entry was posted in Conservation, Nature and tagged Earth Summit, Puffins, Rio+20. Bookmark the permalink.